So July, also known as: The Month Without Dairy, is wrapping up. Dairy was an interesting first item to put on the chopping block. In some ways it was easy. I don’t drink milk. I rarely eat yogurt. I don’t keep ice cream around the house. But when I started this month, I knew that giving up cheese was going to tear me up inside. 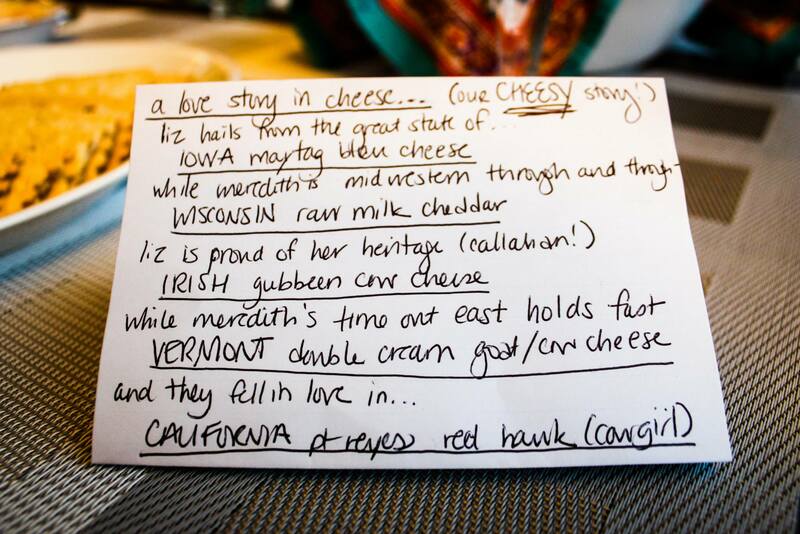 We entitled it ‘our cheesy story’ (her idea) – and it was delicious. Despite this love of cheese, I knew the payoffs would be big if I could tackle dairy: I remembered when I lived in Singapore a few years back and, in keeping with local food customs, I ended up eating very little dairy. I felt fantastic. Now this could have been the result of just being twenty-four and working out a lot, but it seemed like at least a directional indicator that there might be some traction to this no-dairy thing. First, the biggest challenge of the month was not cheese. (What?!) Instead, my biggest test came when my good friend Jes (a once-and-future Californian) came to visit San Francisco and requested “California-style frozen yogurt.” (Ahh, frozen yoghurt! I had forgotten about you!) Here in California we do such a good job pretending that frozen yogurt is healthy; between the tart flavor of the froyo and the fresh fruit toppings it feels like you could eat it for breakfast. Some shops even offer to replace your frozen yogurt with Greek yogurt. (Let’s be honest; no one gets the Greek yogurt.) So it was not cheese, but the request for froyo that brought pain to my heart. I will testify, however, that a bowl of fresh strawberries, mango, raspberries and blueberries with some graham crackers is not a bad substitute. Frozen yogurt shops are just fruit shops in disguise. My bigger realization, however, was that dairy is the ultimate accompaniment. There are a lot of unhealthy foods that end up being unbalanced without dairy to cut the taste. For example, my sweet potato fries were not half as awesome without the ranch dressing on the side, so I ate fewer fries. Similarly, when they broke out the sundae bar at my friend’s wedding, I created a big ice cream-free bowl of toppings for myself. But, quite honestly, you can only eat so many brownie bites covered in caramel before the sugar overwhelms you. The fried, the fat, the sugar – they all end up being too much if you can’t pair it with dairy. Thus, when I cut out dairy, I eat less of the rest of the crap. It’s an unexpected halo effect if you can give up the dairy. But if you cave to dairy, the rest of the unhealthy food comes piling in. In that sense, dairy is the gateway drug. Difficulty to sustain: Easier than expected, particularly if I could give myself a once-a-month exemption for some sort of frozen yogurt or cheese. Or maybe I can start a rule like “The Dairy Stands Alone” so that I can eat low-fat dairy like string cheese, but not have the gateway drug effect. And with that, welcome to: August, The Month Without Sugar. This month will be most interesting…..and the most challenging. Many of the “experts” are split on ‘fruit’ as a sugar. I suspect you will do more ‘label’ reading this month. I think for the sake of ‘not making myself nuts’, I am going to have to let myself have fruit sugar. Maybe there will be another entire month of ‘The Month Without Fruit’ but it just seems so draconian. Where do you come out, Uncle Frank? I was just thinking……….one reason to give up any of your food group choices is to see how your body feels after the detox. I think Part B may be in order……..how does your body feel after you reintroduce, for instance, dairy back in your diet. It may be difficult to determine how your body feels after 30 days because the change is slow over time. So the question may be: how does your body react, positively or negatively to the food group……or parts of the food group introduced back into your diet. If you have no reactions, you may not need to eliminate that food from the diet. The reintroduction of a food may be the most important part of the experiment. This may need to be done before you eliminate sugar so you don’t skew the results……or are you going to continue to eliminate dairy from your diet as you remove sugar? If so, this is a moot point. I’ve been thinking about this a lot as I come to the end of the month without sugar. What I’ve realized after the first two months is that a lot of the experience is not so much the physical impact (agreed that you can only observe some portion of that after only a month), but is really the emotional and experiential impact. It’s almost more about how dairy or sugar or alcohol fits into my life and how I relate to it rather than the physical piece. In a way, it’s almost like giving up smoking – some portion of it is physiological, but so much of it is psychological. This is all turning out to be the same. So maybe an imperfect scientific experiment, but an enlightening emotional one!